Crops - Horsley Farms Inc.
We grow premium alfalfa hay in 3-twine, approximately 120-lb bales. All our alfalfa is barn-stored. We offer small or squeeze loads. Our alfalfa test well and is popular with regional small dairies. We have a limited amount of grass and grain hay each season. Our grass usually sells out before we even get it into the barn. Horses love it! We also have straw available. Clean barley straw, 3-twine, approximately 90 to 100-lb bales. We grow between 500-2000 acres of cereal grain per year. We specialize mainly in feed barley and wheat. We can grow both certified organic grain and conventional grain. 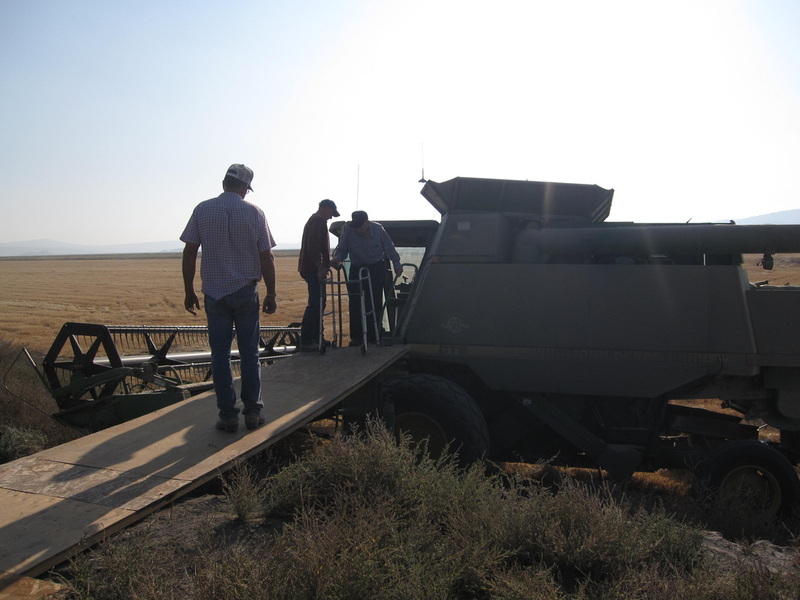 Grandpa Dan's special gang plank into the combine.